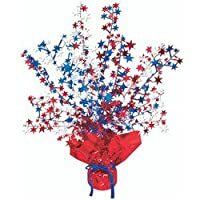 tb12pats Bought this product for a patriotic themed party for my son who is in the military. Product was shipped super fast and I am happy with the over all quality. Would deff buy from this company again. MrsToomer Very festive adornment for political float in summer parade. Used to simulate fireworks-very effective! Attached to float w/double sided mounting tape. Next time I'll order twice as many of this type of decoration as I think I need - it makes great filler. Of course, maybe I need to learn when enough is enough! LOL! Madame Reed We used these at an outdoor party under a tent. The wind was very strong so even though the decorations are heavy, we had to put duct tape under them to hold them up. They would be super for indoors or on a non-windy day outdoors. I can reuse them. They're too nice to throw away. a2phillips We used these at an outdoor party under a tent. The wind was very strong so even though the decorations are heavy, we had to put duct tape under them to hold them up. They would be super for indoors or on a non-windy day outdoors. I can reuse them. They're too nice to throw away. Ken the Reunion Coordinator Used as Centerpiece at U.S.Navy Reunion. It was exactly what I was looking for. Thank you. Pat I used this product to decorate for an awards banquet for our local Fire Department! Was great! Smkmart Don't let the picture fool you. It is very small and I would not call this a centerpeice! Quality Gal I used these patriotic centerpieces to celebrate my husband's book signing party. They were perfect for the celebration as our theme was saving America as an industrial nation. The centerpieces are absolutely beautiful and a good bargain. AZSunshine Bought 8 of these to use as table decorations. The only con if you can actually call it that is the thin wire had to be carefully bent into shape. Took time and care to get the desired fullness to the centerpiece. They looked great when done!